The Cuboid is a Variable Wattage/Temperature control mod advanced vapers are sure to love! 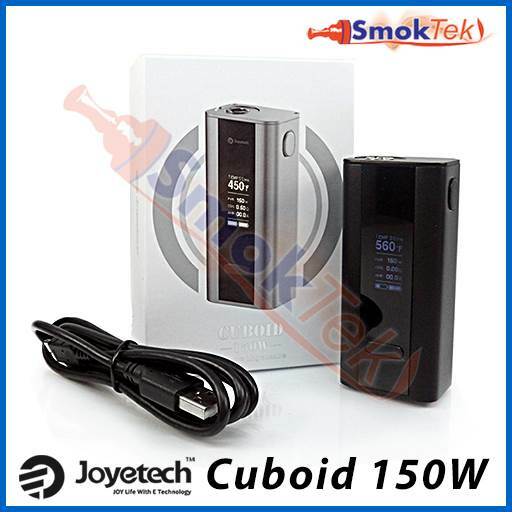 Sure to impress experienced vapers, the Cuboid by Joyetech is an advanced Variable Wattage and Temperature Control mod. A main benefit of Temperature Control is the ability to avoid burnt or "dry hits" while vaping - this can result from over-heating the coil, or from heating a coil that is dry, due to a low e-liquid level inside the atomizer. In temperature mode, the Cuboid allows you to adjust between 200-600 degrees Fahrenheit (or 100-315 degrees Celsius), and can support the use of Nickel, Titanium, and Stainless Steel wire. 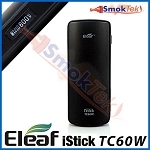 In Variable Wattage mode, this mod has a 150 watt maximum output. 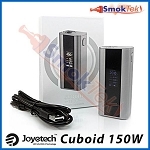 However, the Cuboid comes with upgradeable firmware - you can upgrade your Cuboid to a whopping 200W by downloading the upgrade software directly from the manufacturer's website here. A great feature of the Cuboid is that it does not come with a built-in battery. Instead, it offers the convenience of user-replaceable batteries, so you can quickly swap out drained batteries for a pair of freshly charged ones, as needed. The Cuboid is heavier than most mods. But, it is exceptionally well-built and fits comfortably in the hand, thanks to its small size and ergonomic shape. Compared to many advanced devices of its kind, it is very user-friendly, with only two buttons to press and make adjustments with. The Cuboid has a bright, easy to read 0.96-inch OLED screen with 6-line display. The screen shows your power setting/mode (VW, VT-Ni, VT-Ti, Temp SS316 or TCR), temperature in degrees Fahrenheit, output power (wattage in VT mode, or voltage in VW mode), atomizer resistance in ohms, amperage setting (useful if you are using an RDA/RBA), and finally, a dual battery bar. The dual battery bar is a terrific new feature, allowing you to see the remaining battery life of the individual batteries at a glance. The Cuboid features a stainless steel spring-loaded 510 connection, ensuring that virtually any 510-threaded atomizer will make a secure connection. The Cuboid can accommodate atomizers with a diameter up to ~24mm with no overhang, including the Aspire Triton (22.5mm). However, even wider atomizers like the Kanger Subtank Plus (25mm) look great on it, with the overhang not being very noticeable. The Cuboid is a perfect match with Joyetech's Cubis atomizer. The Cuboid is a terrific mod for advanced vapers, who enjoy using temperature control and atomizers using different types of wire builds. The Cuboid features all standard protections, and some innovative features, like the new customized TCR (Temperature Coefficient of Resistance) mode, which advanced users are sure to love. The TCR mode allows vapers who switch between different coil materials to ensure accurate and consistent temperature control for their chosen wire material. For example, using the Cuboid in VT-SS316 mode is ideal when you are using SS316 wire. But, if you are using a different type of stainless steel wire - like SS316L, SS302, or others - then you are able to switch to TCR mode in order to ensure the greatest temperature control accuracy. 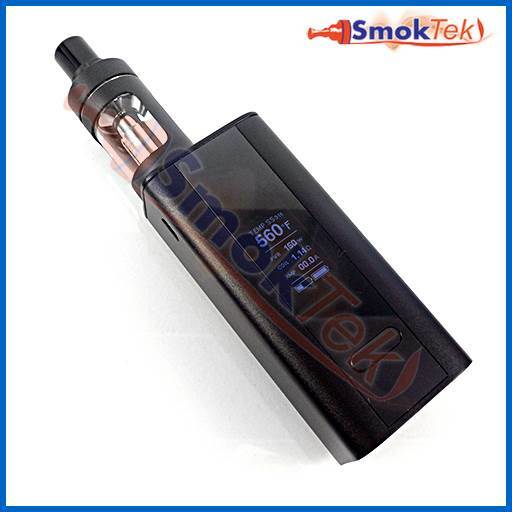 Variable Wattage: from 1.0 - 150.0 W Upgrade to 200W after installing the latest firmware update! Atomizer Short Circuit Protection: If an atomizer short occurs, the OLED will display "Atomizer Short"
Atomizer Low Alert: If the resistance is lower than the specified minimums above, the screen will show "Atomizer Low"
Temperature Protection: In Temperature Control mode, if the actual temperature of the coil is higher than the set temperature, the OLED screen will display "Protection"
PLEASE NOTE: This is an advanced device and we highly recommend you take the time to examine the included User Manual in detail. For a brief overview on using the Cuboid, please click on the 2nd tab above, titled "Feature 6". Please make sure you are using the correct mode for the type of coil you are using. For example, if you are using a Titanium coil, use VT-Ti mode, and so on. Never use kanthal wire/coils with temperature control. The Cuboid has a great safety feature, whereby if you accidentally try using a kanthal wire coil while in temperature control mode, after 2 seconds the device will automatically kick you out of temp mode and into the appropriate Variable Wattage mode. To adjust your output power or temperature setting up or down, press the right or left end of the regulatory button. 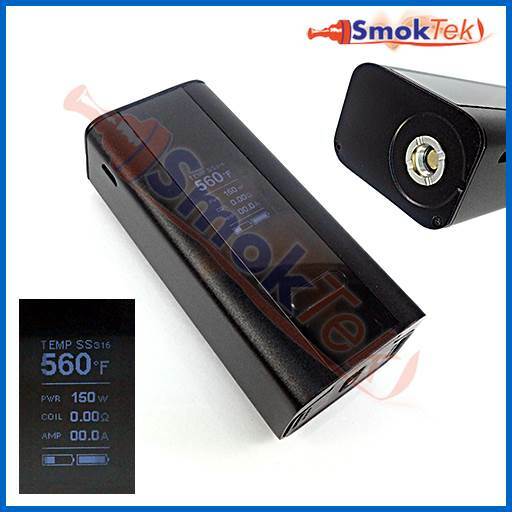 Wattage/Temperature will increase/decrease slowly at first - to adjust at a constant high speed, long-press. The Cuboid offers a Key Lock function, which allows you to lock the regulatory button and prevent accidental adjustments. To lock, simultaneously press the left and right end of the regulatory button until you see "Key Lock"/"Key UnLock" on the OLED screen. 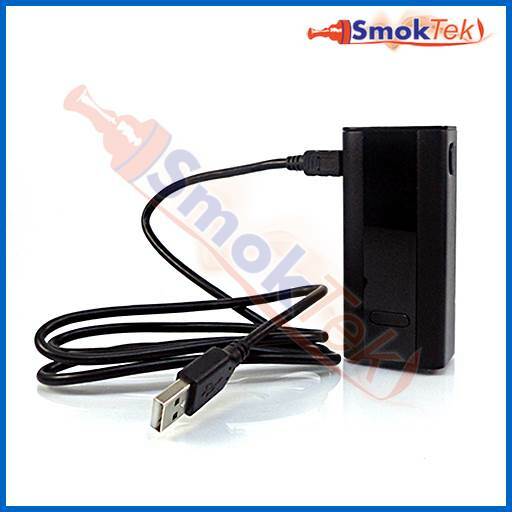 In Temperature Control mode, remember to lock in the atomizer resistance while it is at room temperature. This will ensure consistent temperature accuracy from the mod. To Lock (or Unlock) atomizer resistance, press the fire button 3 times and the left end of the regulatory button 2 times. The second row on the OLED screen will flash. Now, press the right end of the regulatory button to lock/unlock the atomizer resisntance. When locked successfully, a small lock sign will appear next to your atomizer resistance on the OLED screen. Please note: please unlock the atomizer resistance any time you switch to a different or new coil. In Temperature Control mode, you can adjust Wattage by pressing the fire button 3 times. Then, press the left end of the regulatory button, and the third row on the OLED screen will flash. Now, press the right end of the regulatory button to adjust the wattage. Press the fire button to confirm your setting. The new TCR (Temperature Coefficient of Resistance) mode allows you to pre-set and save settings for different types of coils/wire materials that the Cuboid is not pre-set to support. For example, using the Cuboid in VT-SS316 mode is ideal if you are using SS316 wire. But, if you are using a different type of stainless steel wire - like SS316L, SS302, etc - you will want to use the Cuboid in TCR mode, in order to ensure the greatest temperature control accuracy. 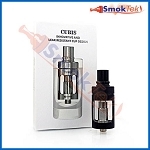 TCR is most useful to vapers who frequently alternate between different types of coil materials. With TCR, you are able to quickly select one of three TCR sub-modes (M1, M2, M3). To use TCR mode, press the fire button and the right end of the regulatory button simultaneously while the Cuboid is powered off. Hold for about 5 seconds. Once you have entered the menu, press the right or left end of the regulatory button to choose between TCR M1, M2, or M3. Press the fire button to select the parameter, and increase or decrease it by using the regulatory button. Long-press the fire button to confirm your selection. The Cuboid manual includes a helpful TCR Value Range chart to help you select the appropriate range for your coil material. If you are building your own coils and are unsure what the appropriate TCR value for your type of material is, you may also find this page useful. 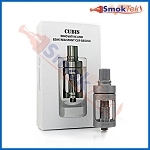 The Cuboid uses 2 x flat top High Drain IMR18650 batteries (not included). Please only use High Drain batteries with a high amp limit (minimum 25A) in this device. 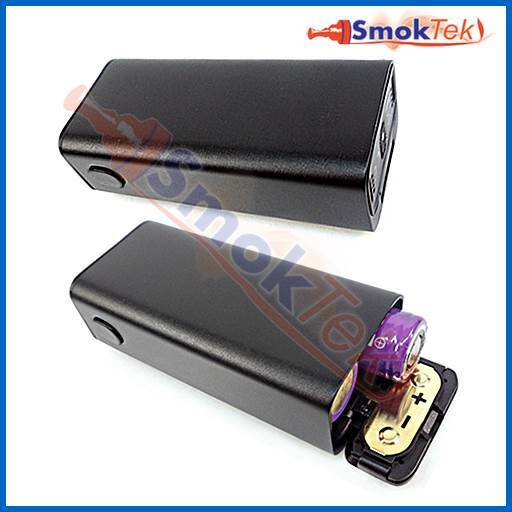 To insert the batteries, open the slip-open battery cover on the bottom of the mod. Insert two battery cells, taking care to insert them correctly as per the "+" and "-" signs on the battery door. When remaining battery life is low, remove the batteries and replace with a pair of freshly charged ones. Or, you may choose to take advantage of on-board charging, and charge your batteries while still inside the device. To do so, plug the included micro USB charge cable into the micro USB port on the top side of the device, and then plug into your computer, OR into a wall adapter and into a wall outlet. You can also take out the drained batteries and choose to charge them separately with an appropriate Li-Ion battery charger. Please note: The Cuboid is not advertised as a Pass-through device, so we do not recommend vaping and charging at the same time.